Join us for a special interview with kaiju Keizo Murase from G-Fest 25! I am thrilled to bring you this interview with Keizo Murase, a kaiju suit-maker from the showa era and beyond. 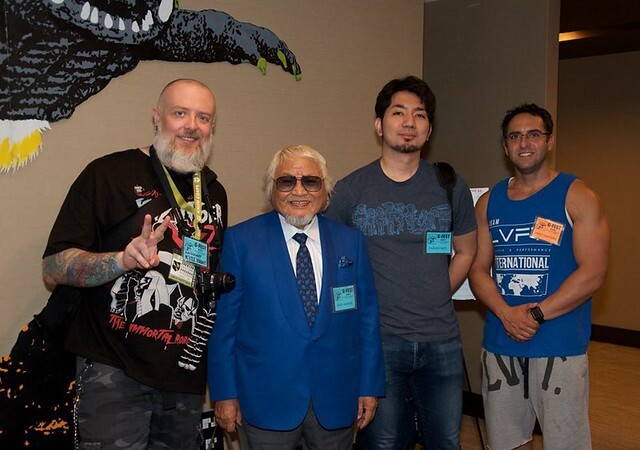 I originally met Murase in 2016 when he was a guest at Monsterpalooza. I did a poor job of coordinating interview options and ended up not sitting down with him at all during that trip. Let me tell you, that was a huge regret for about two years! 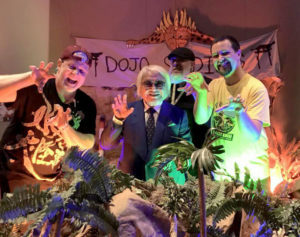 Thankfully, the crew from the annual Godzilla convention, G-FEST, heard my kaiju prayers and brought this living legend to the show. Let me share with you just a portion of Keizo Murase’s monster roster: Daikaiju Varan (1958), Mothra (1961), King Kong vs Godzilla (1962), Gorath (1962), Matango (1963), Dogora (1964), Ghidorah the Three-Headed Monster (1964), Frankenstein vs. Baragon (1965), Gamera (1965), Daimajin (1966), Terror of Mechagodzilla (1975), Godzilla vs. King Ghidorah (1991) and Godzilla vs. Mothra (1992) — the point is that this man’s career is vast! And because of that, we could only cover a small amount of it in this interview. Let’s all cross our claws that the Kaijucast has an opportunity to welcome Murase-san back to the podcast in the near future! I didn’t mention this in the recording, but make sure to check out the gallery of images from Murase’s prop room at the convention, featuring a number of reproductions that were made exactly as they would have been in the showa era! Thanks to David Eric Dopko for sharing his photos. Don’t forget! We’re covering Godzilla vs Biollante for our Daikaiju Re-Discussion this month. If you’d like to send in your homework, please do so before August 24th to be included in the episode.